Danish artist duo AVPD (Aslak Vibæk and Peter Døssing) have created a new work for die raum entitled Vertical Time. The piece is a light installation in slow but constant transformation. 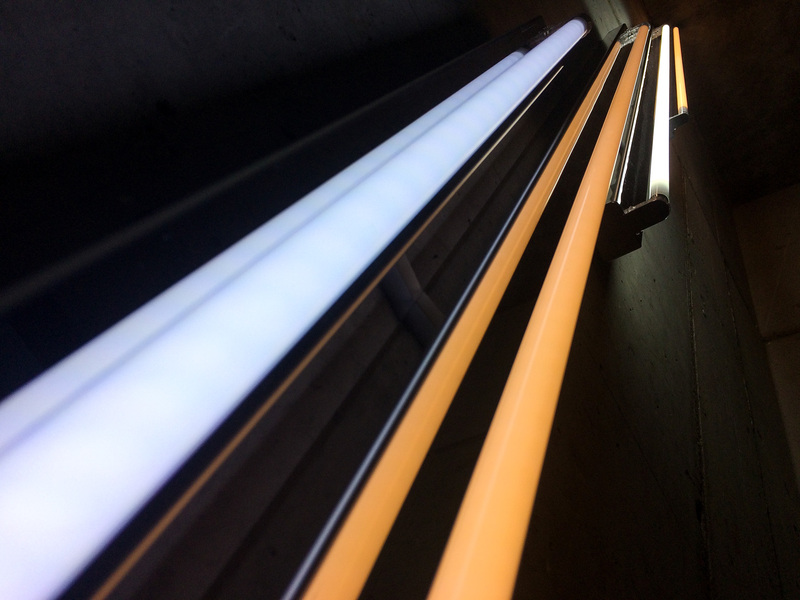 It consists of 4 strip lights in two different daylight tones mounted on the wall in a vertical formation. The fluorescent lamps are programmed to constantly increase or decrease in light intensity from 0 —100 %, each in their own cycle, independently of the others. The cycle of the whole piece lasts 100 000 seconds or 27.7 hours. Due to the physical characteristics of die raum, the viewer is able to experience the full installation cycle at any time, day or night. Slightly out of sync with our daily 24-hour rhythm, the installation will produce subtle shifts of ever-changing light levels during the entire exhibition period — akin to a slow, asynchronous pulse. With an affinity to phenomenology, AVPD’s often large-scale, minimal in­stallations focus on human perception in time and space. With a simple gesture, using the white cube fixture of the strip light, Vertical Time engages with the complex structure of temporal consciousness and the notion of a ‘specious present ’ — the hypothesis that the present is always of a certain duration, a product of time passing.